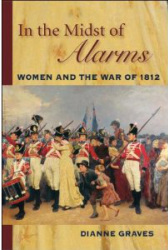 This is a groundbreaking study of women – American, Canadian, British and aboriginal – who experienced the War of 1812. Dianne Graves distils her years of research in diaries, records, memoirs and correspondence into a colourful examination of the ­ordeals, tragedies and triumphs of women who endured a conflict wished for by neither of the belligerents. She describes the woman’s world of early 19th-­century North America: courtship and marriage, ­domestic life, childbirth and employment. Along the way she looks at fashion and clothing, cooking and gardening. She goes on to examine the lives of women whose men were in uniform – from the wives of senior officers to the camp followers – and she chronicles the experiences of women caught up in the war, from high society to low life. We meet dozens of fascinating women, among them Dolley Madison, the republic’s gracious First Lady, and her counterparts, Catherine Prevost and Lady Sherbrooke, the wives of the senior British commanders. There are famous belles – the daring Betsy Patterson Bonaparte of Baltimore and the vivacious Julia de Rottenburg of Montreal. We meet Eliza Romley, who, disguised as a man, joins the United States Navy and is captured in action, and Elizabeth Stewart, an American who proves to be an effective British intelligence agent, and 16-year-old Amelia Ryerse, who watches in horror as invaders burn her widowed mother’s farm. There are Tecumapease of the Shawnee people and Rachel Jackson, whose personal influence shaped major leaders of the conflict. Finally, there are scores of other women, some nameless, who come to life again in this fascinating and informative work of social history. This is a fascinating examination of the lives of ordinary and extraordinary women and a detailed, well illustrated book that provides a unique insight into the war as experienced by women from all levels of society. A native of England, Dianne Graves studied languages before embarking on a career that has spanned international education, travel and public relations. She is the author of Crown of Life: The World of John McCrae, the biography of the man who wrote the famous poem “In Flanders Fields,” and Redcoats and River Pirates, a historical novel for young readers set on the banks of the St. Lawrence in the 1830s. She is married to military historian Donald E. Graves and resides with her husband in a farmhouse in the ­Mississippi River Valley of Upper Canada.